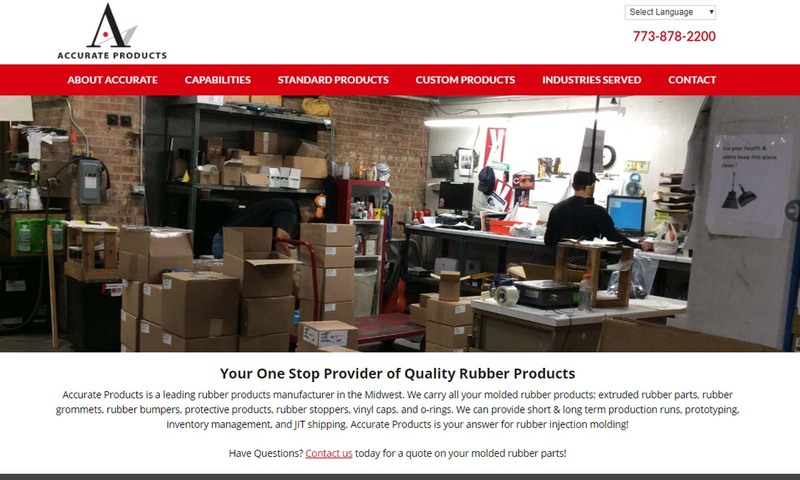 A reliable source for Rubber Molding information and a resource for accessing leading Rubber Molding and suppliers. Rubber molding manufacturing involves shaping raw rubber materials into functional products. Rubber molding is an operation in which raw melted rubber takes form inside a mold. Rubber Molding Rubber molding manufacturing involves shaping raw rubber materials into functional products. Rubber molding is an operation in which raw melted rubber takes form inside a mold. 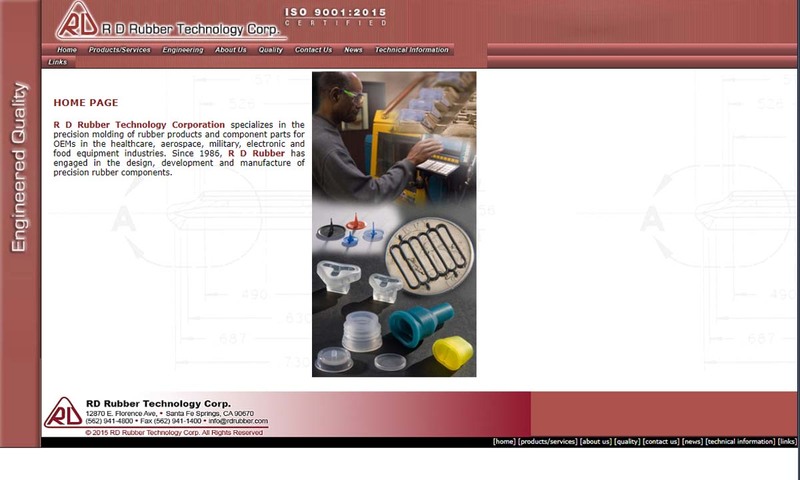 RD Rubber Technology Corp is an ISO 9001:2008 certified company. We offer injection, LIM and transfer molding, rubber to metal bonding, engineering support, tooling design and more. Rubber molding is what we do best. We believe in offering our very best to all customers no matter how large or small. For over 65 years we have pushed the boundaries of what we do and continue to improve our products and customer service every day. 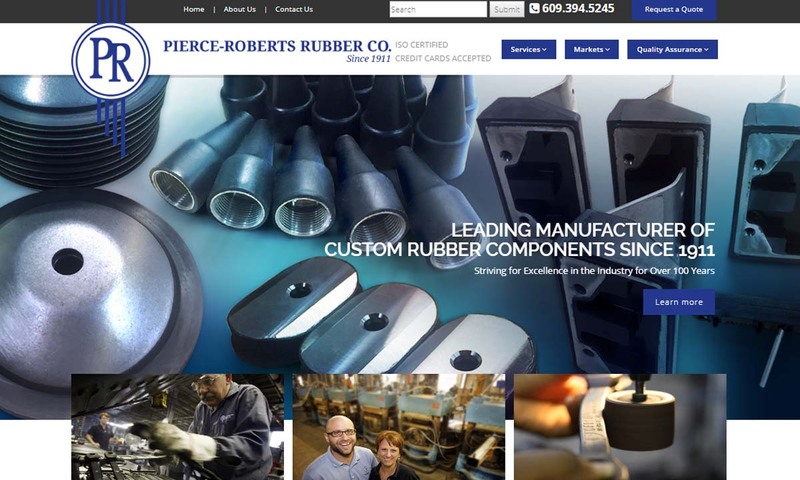 With more than a century of manufacturing experience, Pierce-Roberts Rubber Co. is your source for custom molded rubber products. 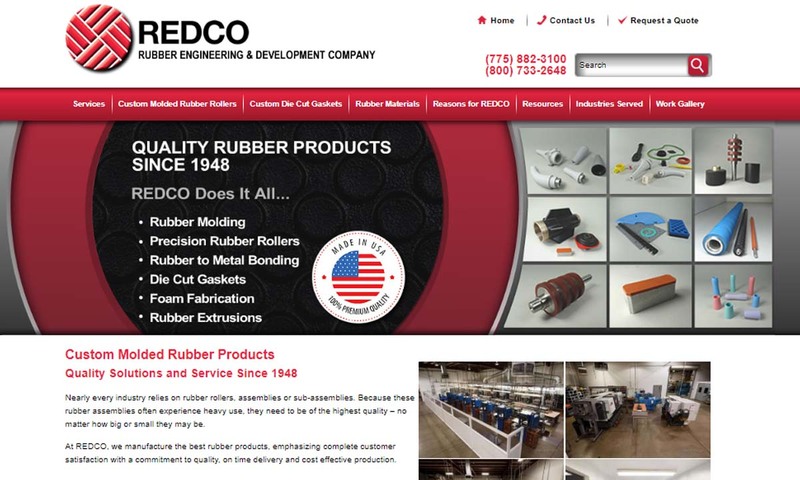 REDCO Rubber Engineering & Development is your complete source for rubber molding products, including rubber rollers, die-cut gaskets, and custom rubber products to suit your application. 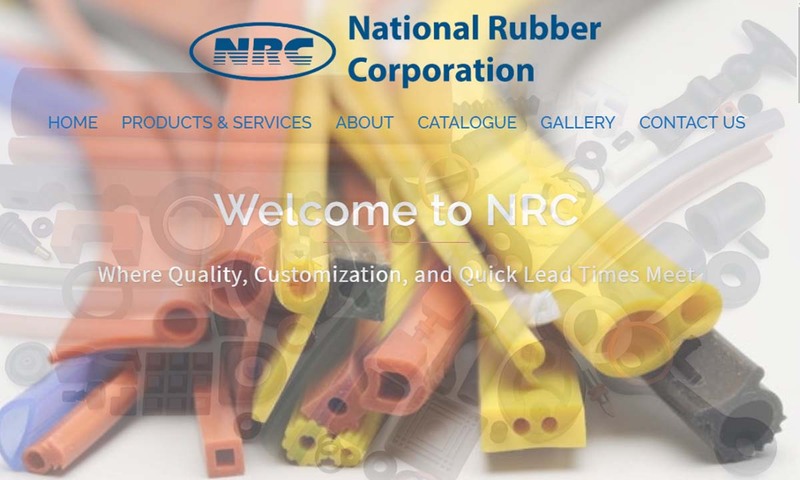 National Rubber was founded in 1997 with the values of variety, consistency, quality, open communication, and timely delivery at its core. 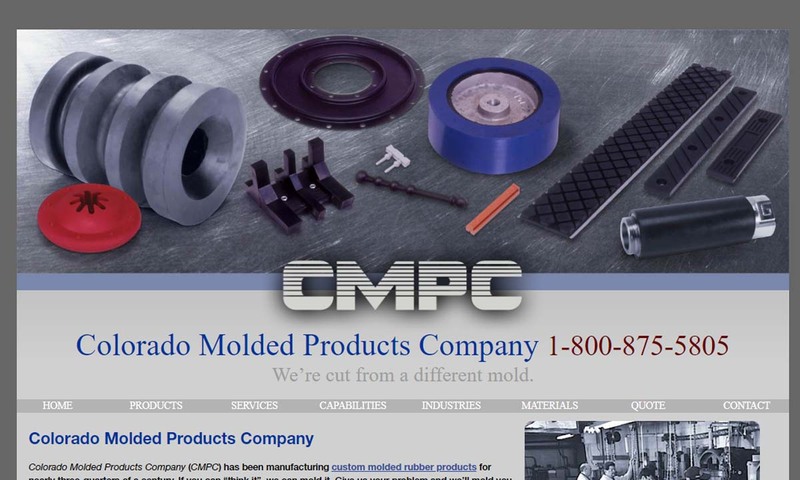 Turn to Colorado Molded Products Co. for outstanding rubber molding. Our custom molded rubber solutions are ideal for a number of applications and we are proud to say that all of our products are made in the United States. 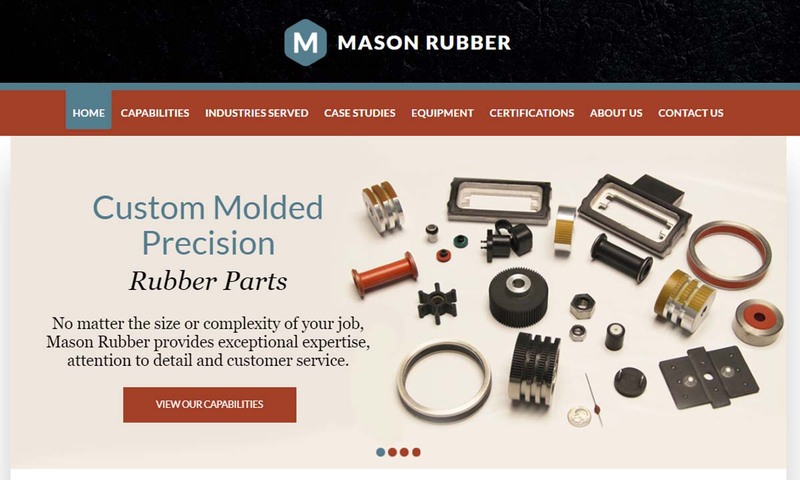 Mason Rubber is a full-service organization assisting in the designing or reverse engineering of custom product to fulfill your production requirements. To one extent or another, molded rubber products span across every industry. Examples of these industries include: medicine and healthcare, electronics, aerospace, automotive manufacturing, transportation, sports and recreation, EMI shielding and sound management. Countless products are made using the rubber molding process, due to its precision results. Rubber molded parts can be designed to fit into any piece of equipment without any risk of leakage. In addition, because of the existence and capabilities of synthetic rubber, industries such as health care, can make use of numerous applications while reducing the health risk. For instance, alternative materials are available for people with latex allergies, and intravenous fluids can pass safely through silicone tubing without causing allergic reactions. Many kinds of complex rubber products are made this way. Examples include: oil and gas components, fluid pumps, rubber diaphragms, customized buttons, vibration absorbers and isolators, rubber seals, rubber grommets, rubber washers, rubber bushings, cable boots, EMI shielding products, surgical instrument parts, blood analysis machines, keypads, electrical connector inserts and rubber sheet. Rubber grommets are a useful component that is used extensively for industrial, consumer, and commercial purposes. Rubber grommets are made to fit around a hole in a surface, protecting wires or other hardware that must pass through it. Grommets can also protect the hole itself from wear or damage. Rubber grommets can be found protecting wires from becoming disconnected, or aligning the holes in desks which allow safe passage for computer wires. Since many manufacturing machines contain moving parts that can vibrate excessively, rubber washers and rubber bushings are installed to secure these moving parts and absorb vibration in an effort to protect the people operating them. A rubber sheet is a large, thick sheet that reduces vibration and noise in a machine when placed underneath it. The reduction of vibration and noise can greatly improve overall safety and working conditions. Natural rubber has likely been in use in some form or another for a very long time. Specifically, some South American tribes report that their people have been using rubber tree sap to make household items for thousands of years. In addition, we believe that rubber was used by the Mayans as far back as 1600 BC. Rubber molding, though, didn’t really start taking place until after the development of vulcanization. Once scientists learned how to do this, they could process rubber without degrading it. Before vulcanization, people were using rubber, but with less success. It all began in 1823, when Scottish chemist Charles Macintosh discovered that by applying rubber mixed with a coal-tar byproduct to one cloth, he could glue it to another. The use of rubber products quickly spread across Europe and to the United States. Time and time again, rubber product users found that the rubber (excluding erasers and shoe soles) often deteriorated quickly and stank. Also, it became gummy in hot weather. This went on until 1839, when American Charles Goodyear learned how to vulcanize the rubber. He learned that if you add Sulphur to the latex rubber, the polymers will stabilize and the rubber will become durable. He received a patent for the vulcanization process in 1844. Nevertheless, this process wasn’t used much until after 1889, when manufacturers began creating rubber bike tires and rubber automobile tires. By the early 1900s, the demand for rubber around the world had skyrocketed, eventually leading to the development of synthetic rubber compounds. Today, less than half of all rubber materials manufactured worldwide are made from natural rubber. Brothers Isaiah and John Hyatt patented the first rubber injection molding machine in 1872. Over the course of the rest of the 1800s and the 1900s, others made many improvements on this first molding machine. Also, as chemists came up with new kinds of synthetic rubber, like liquid silicone, engineers were able to come up with new ways of molding. For example, in the 1970s, James Watson Hendry invented the gas-powered injection molding machine, which allowed manufacturers to significantly increase their product output. From the late 20th and early 21st century, one of the most important contributions to rubber molding has been automation. Today, the rubber industry relies on a mixture of CNC technology and CAD programming to create a high volume of custom mold rubber products. The various types of rubber that can be molded include natural rubber, as well as synthetic rubber such as neoprene, foam rubber, EPDM, silicone rubber, and liquid silicone rubber. While synthetic rubbers have the same positive qualities as natural rubber, they display other qualities as well. Synthetic rubbers can be made corrosion-resistant, heat-resistant, ozone resistant, inert with certain chemicals, and made with varying degrees of properties such as rigidity, flexibility, durability, and strength. Natural rubber comes from the sap of certain trees, such as some trees of the genera Ficus. Most often, though, it is extracted from the Pará tree (hevea brasiliensis), more commonly known as the rubber tree. Agricultural workers get it by tapping into the tree, just as you would get maple syrup from a maple tree. Rubber producers then mix the sap with formic acid to get it to coagulate. This uncured rubber substance contains latex. For this reason, it is often passed over by manufacturers looking to avoid causing an allergic reaction. The first synthetic rubber to be produced on an industrial scale was neoprene. Developed by DuPont in the 1930s, it is a general-purpose chloroprene polymer. Manufacturers use it to mold liners, gaskets and various gardening and household items. Neoprene products are susceptible to degradation at the hands of chemicals like acetic acid, turpentine and iodine. Foam rubber is manufactured with foaming agents that make it flexible and air-filled. It may be made from a number of different rubbers, but most often, it is made from polyurethane. Foam rubber can be twisted, scrunched, stretched, pushed or pulled without detriment. It comes in two main types: open cell and closed cell. Open cell foam rubber products feature interconnected pores, while closed cell foam products feature disconnected pores. Think of it this way: Open cell foam is open to others; therefore, its pores are connected. Closed cell foam is closed off to others, so its pores keep to themselves. Also, because closed cell foam pores are not spread out and connected, more are able to fit into the space, making closed cell foam denser. Open cell foam rubber is used to make automobile trim, automobile seat padding and padding for pillows and mattresses. It is also used as padding in packaging and for noise control. Closed cell foam rubber is used to make thick auto products, insulation, thermal management products, elbow pads, knee pads, gloves, wetsuits, surgical scrubbers, x-ray positioning pads and orthopedic braces. EPDM, or ethylene propylene diene monomer, is a synthetic rubber with a lot of great qualities. It, for example, has excellent resistance to: steam, ozone, heat and extreme weather. In addition, it provides superior electrical insulation. EPDM is common for use in automotive manufacturing (electrical gaskets and door seals) and building construction (roofing materials). It is also an important component of engine cooling system hoses. Silicone rubber is a synthetic rubber made up of silicon, oxygen, carbon and hydrogen. It comes in both liquid and solid form. Solid silicone rubber is quite easy to sanitize, making it popular in the food processing, medical and biotech industries. Both forms are high temperature resistant and remain stable when exposed to temperatures up to 446℉. Because of its heat stability, silicone rubber is popular for use in metal casting. Silicone rubber, however, has poor fuel and mineral oil resistance. For applications involving those substances, fluorosilicone rubber is a good substitute. 2. Design the die or mold cavity you will use to shape the raw rubber, known as stock. 4. Deposit the stock into whatever machine you use. 6. Eject the rubber shape. Once removed, the mold could have certain imperfections such as seams. If this is the case, the rubber product may have to undergo further processing if necessary. It is possible to add a variety of finishes and textures to the final product to add an aesthetic touch. When preparing to mold a part, manufacturers first think about how the product should look, what qualities it must have and its dimensions. By considering these, they can pick a rubber material with which to work, then turn to their computer programming to create a precise design. Custom rubber molding, especially, custom rubber injection molding, is a very popular choice with customers because, while it is more costly than standard molding, custom molding is still less expensive than alternative rubber manufacturing methods. Custom mold design offers the possibility of shapes, finishes, textures, tolerances and dimensions made unique just for your application. The types of rubber molding include injection molding, liquid injection molding, insert molding, compression molding, transfer molding and blow molding. All six methods have their similarities; however, injection molding is used more widely than any other method. An alternative method to rubber molding in general is rubber extrusion. The first step in the injection molding process involves collecting raw rubber material, known as stock. The stock is then placed into a hopper that is suspended over a conveyance channel. The stock is then released, and processed through a channel that features a large turning screw. By the time the stock reaches the end of the channel, it is completely melted as a result of a combination of the heating elements within the channel, and the friction caused by the screw’s motion. At the end of the channel is a mold cavity into which the molten rubber is injected. The elements of heat and pressure work together to ensure that the molten rubber fills the cavity entirely, down to the very contours of the mold, and is uniformly distributed. The molten rubber is allowed to cool and harden within the mold, and can be safely removed from the mold cavity once it reaches a solid state. Liquid injection molding is quite similar to regular injection molding. The difference is mainly that manufacturers use liquid stock as the starting raw material. In addition, the machinery used includes a metered pump that helps regulate and control stock flow. The pump discharges the liquid, which manufacturers then mix with any additives. Once mixed, a nozzle injects the mixed liquid into a shaped mold. The manufacturers then close the mold tightly with clamps and apply the appropriate amount of heat and pressure for creating the product. By liquid injection molding rubber, manufacturers can produce products more quickly, since they do not have to liquify the stock. Also, liquid injection molded products require very little finishing. Insert molding is a type of rubber and plastic injection molding. During insert molding, manufacturers mold or form rubber parts around non-rubber parts, called inserts. Common insert products include knife blades and surgical tubes. Compression molded parts are made when the manufacturer pre-weigh, pre-measure and preheats the stock, and then inserts it into a pre-shaped mold cavity. After that, they close the mold, compressing and squeezing the stock until it stretches into it takes on the shape of the mold. Then, they allow it to harden and cool before removing it. The compression molding process is often followed up by secondary processing for the removal of excess material (flash). Through rubber compression molding, manufacturers can make large, intricate products quite inexpensively. However, the results are not always consistent. Like compression molding, during transfer molding, manufacturers take a pre-weighed and pre-measured rubber stock, or “preform” and insert it into a cavity above the mold, called a “pot.” Once the stock is placed, they press a heavy mechanical ram into it while applying heat. This forces the preform into the mold via a runner and gate system, where it melts. Manufacturers keep the ram in place until the preform takes on the shape of the mold in its entirety. Transfer molding is valued because it allows manufacturers to not only produce precision molded rubber products, but also rubber products bonded to metal surfaces. Rubber blow molding is a molding process by which hollow rubber products are formed. It involves the use of a parison (tube-like plastic shape with a hole in one end) or preform. To expand the part, manufacturers clamp the parison to a mold and then blow compressed air into the parison hole. As the rubber expands, it touches the mold and takes on its shape. After it cools and hardens, manufacturers open the mold and eject the newly formed part. Rubber parts can alternatively be produced through rubber extrusion. However, extruding machines have much more limited capabilities. An extruder only has control over the X and Y axes, and are thus much more suited for the production of simpler rubber products such as rubber baseboards or rubber sheets. Rubber molding allows from design control over three axes due to the process involving a molding cavity instead of a die. Rubber molding offers quite a few benefits, especially when compared to other rubber forming techniques. First, rubber molding offers versatility. This is because rubber molding manufacturers can make use of so many different types of rubber-based raw materials, and also because they can produce a wide range of complex custom parts. Second, rubber molding is efficient and reduces production time. It is also well-paired with large volume runs. When selecting a rubber molding service provider, you need consider the following: What’s my application? What qualities must my molded product have (tensile strength, corrosion resistance, flexibility, temperature resistance, etc.)? Do I need to adhere to any industry/regional standard requirements? How much customization do I require? How many items do I need? What’s my budget? What’s my timeline?  By knowing the answers to these questions, you can 1) know what product and service offerings to look for when researching, and 2) have a more productive conversation with your prospective manufacturers. We know that there are a lot of manufacturers and suppliers floating around out there, some of dubious quality. So, to help you wade through the muck, we’ve provided on this page a comprehensive list of experienced, quality manufacturers you can trust. To learn more about each of them, check out the profiles we’ve provided. Try to choose three or four in whom you’re most interested, and then reach out to each of them with your specifications. Have those production conversations we talked about, and when you’re done, compare and contrast their answers. From among them, choose the one you feel can offer you services (including customer services) best aligned with your interests. Call them again, and get started! Good luck.